Make Yourself Comfortable was one of a string of hits that American jazz and pop vocalist Peggy King had in the 1955. It peaked at #30. King bounced around in both music and TV shows and notably sang commercial jingles for Hunt’s tomato sauce and her two best-selling albums Wish Upon a Star and Girl Meet Boy. The Broadcast Pioneers of Philadelphia inducted King into their Hall of Fame in 2010. King continues to perform in nightclubs, theatres, charitable and private events. Robert Larimore Riggs was born in Los Angeles. He began playing tennis at age 11 and quickly rose to the top of the Southern California tennis circuit. He won the U.S. Junior title in 1935 and claimed the U.S. Clay Court Championship in 1936. He was a Top 10 Amateur Player in 1937 and won his first Grand Slam final at the French Open in 1939. At Wimbledon, Riggs won the men’s singles, doubles and mixed-doubles tournaments. After winning the U.S. National Championships, Riggs was ranked #1 in the world. In 1940, he won the U.S. Championships again. Riggs went pro, after a stint serving in the U.S. Navy. He defeated Don Budge at the U.S. Pro Championships in 1946, 1947 and 1949. In the 50s, after his tennis career waned, he worked for the American Photograph Corporation. Riggs was inducted into the International Tennis Hall of Fame in 1967. In 1973, he publicly lobbied to play the leading women’s tennis professionals. His first opponent was Margaret Court, the top ranked women’s player. Riggs defeated her. 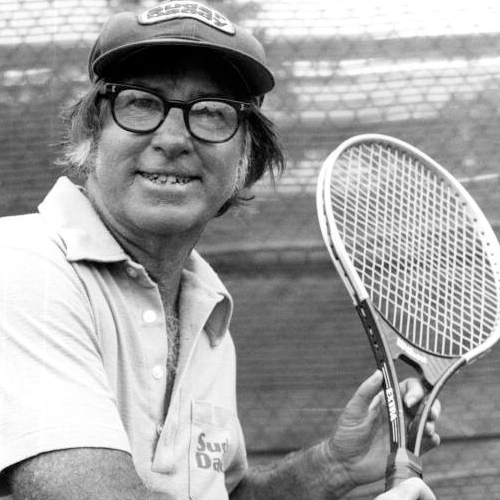 On September 20, 1973, Riggs took on 29-year-old tennis champion and advocate for women’s rights, Billie Jean King. At 55 years of age, Riggs was unable to keep up with the youngster. She easily won. This Battle of the Sexes match led Riggs to more fame and financial opportunities than he had ever seen even when he was a top player. He spent his later years working as a resident tennis pro for a Las Vegas hotel and enjoyed success on the men’s senior tennis tours. Riggs died of prostrate cancer on October 25, 1995 at age 77. 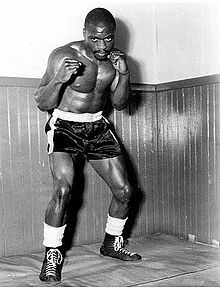 Born in Clifton, New Jersey, Rubin “Hurricane” Carter was the fourth of seven children. He stabbed a man when he was 11 and sent to a juvenile reformatory. After he escaped in 1954, he joined the Army. After basic training, Carter was sent to Germany where he began boxing. He was discharged in 1956. He returned home and was quickly convicted of two muggings and sent to prison. He was released from prison in September 1961. Here, Carter turned to professional boxing. Though he was shorter than the average middleweight, Carter had an aggressive style and punching power that resulted in numerous early knockouts. He became a crowd favorite and his style earned him the nickname “Hurricane.” Carter’s career record stand at 27 wins, 12 losses and one draw. He had 19 knockouts (8 KO and 11 TKOs). Carter received an honorary championship title belt from the World Boxing Council in 1993 and was inducted into the New Jersey Boxing Hall of Fame. Unfortunately, his penchant for not following the law would also catch up to him. On June 17, 1966, two men entered the Lafayette Bar and Grill in Paterson, New Jersey and began shooting. The bartender and a male customer died at the scene, while a female customer died in hospital a month later. Another male customer was able to survive the shooting. Though neither customer identified Carter or his friend John Artis as the shooters, a petty criminal named Alfred Bello and a female eyewitness were able to place Carter and Artis as running into a white car just after the shooting. When police searched the car, they found ammunition which matched that at the scene of the crime. Though they took no fingerprints from the bar nor tested the guns for gunshot residue, both Carter and Artis were tried and convicted — twice (in 1967 and 1976). The second conviction was overturned in 1985 and prosecutors had had enough and chose not to attempt a third. Carter moved to Toronto (becoming a Canadian citizen) and became the executive director of the Association in Defense of the Wrongly Convicted from 1993 to 2005. Carter died from prostate cancer on April 20, 2014 at age 76. Carter inspired singer Bob Dylan’s song “Hurricane” in 1975 and the 1999 film starring Denzel Washington about his prison stint for murder. 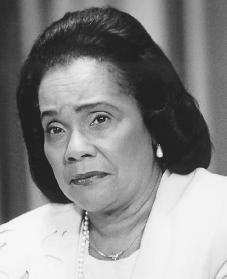 Coretta Scott was born in Marion, Alabama. She met her husband Reverend Martin Luther King Jr. while in college. Initially, Scott was interested in pursuing a career in music, but as she fell deeper in love with King, she realized that wouldn’t be feasible. Scott and King married in 1953 and had four children. Alongside her husband, Scott was an active advocate for the equality of African-Americans and led the Civil Rights Movement in the 1960s. In fact, Scott has been called the “First Lady of the Civil Rights Movement.” King’s 1968 assassination did not dampen the struggle nor her involvement. She simply took on the full leadership role and became active in the Women’s Movement and the recent LGBT rights Movement. Scott founded the King Center and sought to make King’s birthday a national holiday. In 1983, Scott’s fight for MLK day came to fruition under President Ronald Reagan. As a result, Scott became friends with numerous presidents, including John F. Kennedy, Lyndon B. Johnson and Robert F. Kennedy. In August 2005, Scott suffered a stroke and was left paralyzed on her right side and unable to speak. In January 2006, Scott died of respiratory failure due to complications from ovarian cancer. She was 78 years old. Her funeral was attended by four of the five living U.S. presidents (at the time) and another 10,000 people. She was temporarily buried on the grounds of the King Center before she was permanently interred next to her late husband. She was the first African-American to lie in the Georgia State Capitol upon her death. In 2009, Scott was posthumously inducted into the Alabama Women’s Hall of Fame. Scott and King’s oldest daughter Yolanda outlived her mother by a mere 16 months, succumbing to complications related to a chronic heart condition on May 15, 2007. Yolanda was only 51 years old. worldwide, BTO has sold over 30 million albums. In May 1973, BTO released their first album. With modest sales, BTO threw themselves into some heavy tours and the results paid off. 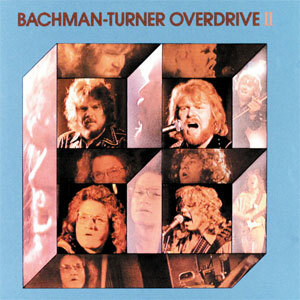 In December 1973, BTO released their second album, Bachman-Turner Overdrive II. BTO II peaked at #4 on Billboard’s Hot 200 Album chart. This album contained 2 of BTO’s biggest hits, Let it Ride and Takin Care of Business. Both songs went to #3 in Canada. Let it Ride peaked at #23, Takin Care of Business peaked at #12 in the U.S.
Tim left the band in early 1974 and was replaced by Blair Thornton. This BTO line-up continued on until 1977. Here, things began to unravel. Randy left the group and BTO officially disbanded in 1980. In 1983, Randy and Tim Bachman, Turner and Garry Peterson (a member of the Guess Who) reunited BTO, but by 1986, more line-up changes were in store. In 1988, BTO returned (Randy, Turner, Thornton and Robbie). But by 1991, Randy left again. In 2003, Bachman-Turner Overdrive was inducted into the Canadian Music Hall of Fame. Currently, Randy and Turner have reunited and continue to tour. Scar Tissue is the memoirs of Red Hot Chili Peppers vocalist Anthony Kiedis. 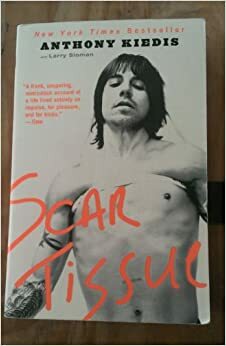 Scar Tissue focuses on Kiedis’ life from 1962 (his birth) to early 2004. The book focuses mainly on Kiedis’ drug addictions. Kiedis claims he began using at the tender age of 11. The title of his memoirs was lifted from the Chili Peppers’ 1999 single Scar Tissue off their seventh album Californication. The single remains one of the band’s most successful singles and chronicles Kiedis’ drug addiction and the effect that these addictions caused within the band. The Chili Peppers took a bit of a break in 2008, but came back with their tenth album I’m With You in August 2011. In January 2012, Kiedis was finally able to have surgery on his foot on which he had sustained multiple injuries. On April 14, 2012, the Chili Peppers were inducted into the Rock and Roll Hall of Fame. They are said to be currently working on their eleventh album.